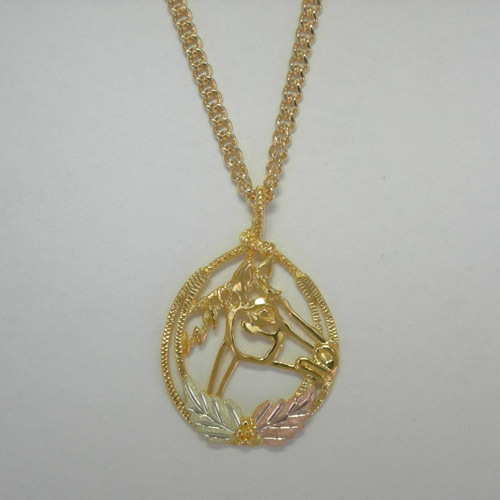 Desc: Black Hills Gold horse head and leaves necklace. The chain is cable link goldtone and has a spring ring clasp. The pendant is 12 karat yellow gold and is oval. A silhouette horse head is mounted in the center of the oval. One rose gold and one green gold leaf are mounted below the horse head. A cluster of gold grapes are mounted between the leaves. The edges of the oval frame and the bale are textured. The necklace has a textured and bright polish finish. The necklace is made in the United States of America.